As Syria’s self-governing and autonomous northeast region recovers from occupation by the Islamic State of Iraq and Syria (ISIS), there is both an opportunity and an imperative to strengthen the region’s local humanitarian groups. While the exact future status of the region cannot be predicted—and regardless of what political positioning may occur—humanitarian aid and strategy must happen now, as needs in the region remain significant. More than 100,000 internally displaced persons (IDPs) are still in camps and informal sites in northeast Syria, and hundreds of thousands have returned to unsafe areas like Raqqa and Deir-ez-Zour. Water systems and electricity grids are still not functioning in many areas. Safe shelter is in short supply, and medical care is scarce. Local authorities do not have the resources necessary to address the situation, and relatively few international humanitarians are working in the region—particularly in the hardest hit areas like Raqqa city. In general, the capacity of these local groups does appear promising, but there are no systematic efforts underway to grow this capacity. Now is the time for the United States and other donors to offer these groups the support they need to thrive. Specifically, new resources for northeast Syria should be channeled through a range of local groups that work with the people and communities in need, regardless of who the local authorities are. Donors should engage in ways that build capacity and enhance this coordination. For their part, the local authorities must facilitate better access to all populations in need. “As local as possible, as international as necessary,” is a principle that has long been talked about in humanitarian response circles, and it can be implemented to great effect in northeast Syria. The Democratic Federation of Northern Syria (DFNS, also called “the Self-Administration”) serves as the de facto governance structure in northeast Syria. 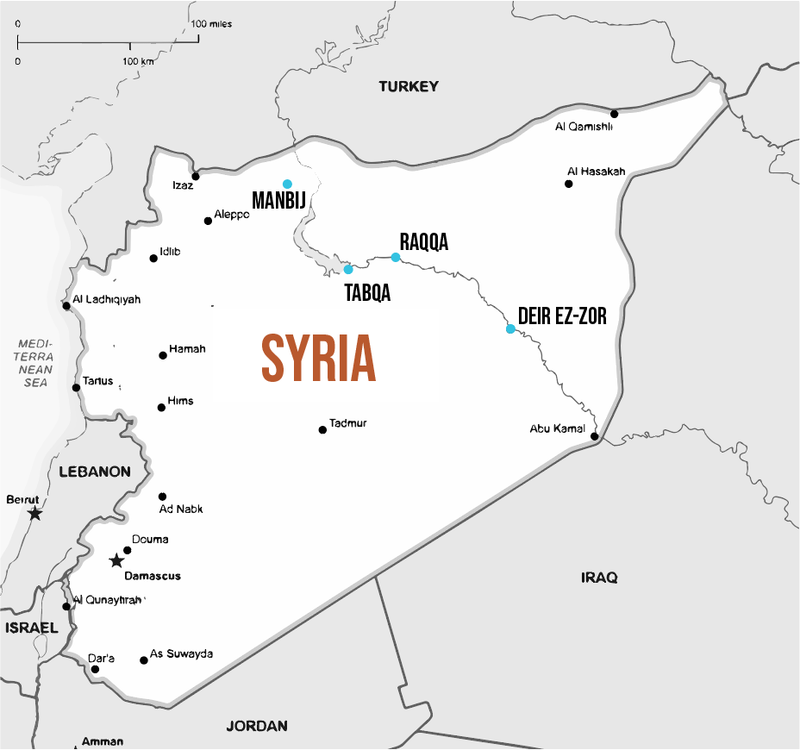 The region is administered independently of the government of Syrian President Bashar al-Assad in Damascus. The Self-Administration has organized the Syrian Kurdish majority areas along the Turkish border into three regions called cantons, each of which self-governs through a system of local councils, committees, and communes. Other areas of northeast Syria that have been liberated from ISIS but exist outside of government control—mainly those with predominantly Sunni Arab populations—are administered by civilian councils with ties to the Syrian Democratic Forces (SDF). These councils run several main cities and their environs in areas where the Self-Administration has not formally established itself as the authority. The councils coordinate with each other and with the Self-Administration on issues like humanitarian assistance. (1) Various people in northeast Syria told Refugees International about the social tensions that exist between these two spheres of control where ethnicity is often a defining factor of communities. Normally, the architecture of a humanitarian response involves coordination among national and local authorities, local and international aid groups, and United Nations agencies. The details of this coordination effort can vary from situation to situation. However, the ideal is to have all these entities communicating and working together to create a shared understanding of vulnerabilities and needs, reaching as many people as well as possible, avoiding redundant programming, and making the best use of resources. Aid organizations that register in Damascus generally cannot work in the area run by the Self-Administration or they risk losing their access to regime-controlled areas. The United Nations agencies, for example, are mostly registered in Damascus and thus limited in their ability to serve northeast Syria. Similarly, aid organizations that want to work in the northeast must register with the Self-Administration and sometimes with other local authorities. This usually precludes the possibility of serving regime-controlled areas. The result is a general divide between humanitarians in regime-controlled areas and those in the Self-Administration’s territory. RI has followed the evolution of local Syrian groups throughout the country since the early days of the conflict. There have been a number of positive changes in the quality of partnerships with international groups, the efforts to build local capacity, and recognition of the strengths of local actors. Northeast Syria is in the same situation of Syria as a whole years ago: multiple local groups are ready to take on more than simply logistics or distributions for international groups. They are ready to participate in assessments, create and implement programs, and work directly with donors to show how their humanitarian action is effective and principled. Their growth will help ensure the region moves forward with a capable humanitarian civil society in the aftermath of ISIS. As in almost any humanitarian response, local individuals and organizations in northeast Syria emerged as the first responders to the crisis. In addition to the people helping their families and neighbors and larger communities, some local groups that pre-dated the conflict and the humanitarian crisis became part of the assistance network. (3) Since the civil war began, northeast Syria has also become home to a number of new non-governmental organizations providing humanitarian aid. The groups struggle to raise funds from a fairly narrow base of individual and diaspora donors and through occasional partnerships with international organizations. The groups also find it difficult to retain staff members in the face of competition from even the limited number of INGOs working alongside them. However, despite these difficulties, the knowledge and understanding these groups can provide on the local context remain invaluable. International organizations usually arrive on the humanitarian scene with significant resources, personnel, and a history of operating inside the international humanitarian architecture. On the other hand, they often lack knowledge of local communities and their needs, access to those same populations, and an inherent understanding of what sorts of humanitarian interventions will or will not work, and why. These are the very same skills and knowledge in which local groups tend to excel. INGOs remedy this in part by hiring local staff who can help with these issues. And in places where civil society already existed, they can create working partnerships with those groups. Local humanitarian groups often develop experience and expertise through these partnerships with other—usually larger, usually more experienced, and usually international—humanitarian aid organizations. International actors increasingly recognize that working with local groups can achieve the most effective response for the vulnerable. These partnerships also support the local economy, job market, and civil society growth—all of which are important region-wide to create social cohesion. The humanitarian crisis in Syria has underscored the need for and potential of partnerships with local groups. From the outset, the United Nations and INGOs have had limited access to the country to provide aid. At the same time, Syrians started both formal and informal organizations to address humanitarian needs. The international groups benefited from these relationships by gaining a partner with local knowledge and access. The local groups eventually began to benefit through funding opportunities, procurement help, and support that built their own capacity to respond. To this day, local groups are responsible for a huge amount of the humanitarian assistance inside Syria, especially in besieged and hard-to-reach areas. Many of the current Syrian humanitarian organizations were only started in response to the conflict but are now major providers of relief. This was made possible in part by deliberate capacity-building efforts by international partners and donors. A number of donors to the humanitarian response inside Syria have insisted on an element of capacity-building for local groups in their grants and programming. The United Nations has gradually found useful ways to bring local Syrian groups into its coordination structures and to help forge partnerships with them. Like INGOs and UN agencies, local NGOs normally must be registered with the authorities in the areas where they work and must have approvals for their programs. Northeast Syria is no exception, and the administrative processes there can be quite complex. Organizations must make themselves known to the Self-Administration, to local committees and offices, and to the civil councils where they exist. The various local authorities in northeast Syria often do allow international and local NGOs access to vulnerable populations in their own jurisdiction. However, humanitarians would be more effective and efficient if there were a one-stop shop for registrations and project approvals. As it stands right now, groups must repeatedly request permission to operate in different territories with different authorities. For example, a group providing assistance in several different IDP camps in one governorate, but in different cities within that governorate, must obtain permission to operate from the authorities in each individual area. This takes time and resources that most local groups cannot spare and leaves space for each set of officials to impose new restrictions on the group. Local groups tend to know where to find the most vulnerable people and can more quickly determine how best to assist them, but the complications they encounter with local authorities can interfere with their work. RI spoke with local group staff members who indicated that their operations were regularly slowed down by the administrative demands of the local authorities. Most groups acknowledged that these requests—for additional paperwork, sign-off by multiple authorities, and organizational re-registration—could usually be eventually addressed. However, the delays created obstacles to consistent, predictable assistance. Such holdups are particularly damaging in the health sector, because medical supplies are limited and the need for health care remains acute in most areas. Authorities across northeast Syria should remove barriers to NGOs’ access and operations in order to facilitate more robust and consistent humanitarian aid. This should include uniform processes for operational groups’ registrations, travel permissions, and project approvals. They should also reciprocally honor each other’s current documentation and permissions in order to eliminate interruptions in vital humanitarian assistance. Even more effective would be for the Self-Administration and area- and city-wide authorities to have harmonized registration and approval processes. If NGOs could obtain one registration, travel permit, or project approval that was valid for the entire region from the outset, they would spend less time on repetitive administrative procedures. In light of the humanitarian aid that the U.S. government is providing in northeast Syria, it should encourage these steps to facilitate operations. Humanitarian coordination in northeast Syria faces unique challenges. The UN Office for the Coordination of Humanitarian Affairs (UNOCHA), which normally coordinates entities working in a humanitarian response, is registered in Damascus. It therefore cannot perform its function in the northeast. There is an internationally supported forum for NGOs that provides much of the coordination that would normally be OCHA’s work. It does an excellent job of connecting with the various humanitarian actors. Its participation is primarily international at the moment, but the forum has begun to expand its other contacts. This forum is in the process of developing outreach to local authorities across northeast Syria and also keeps connected to the UN regional offices (usually based in Amman, Jordan) that handle the humanitarian response for Syria as a whole. However, the forum is a relatively new entity and has not yet had the space to methodically reach out to local NGOs to include them in its coordination structure – a best practice in any humanitarian response. Nonetheless, it is in contact with many of the local groups and has good insight into which groups do what and where. The forum’s staff understand the importance of including local groups and intend to take up this issue as the group develops. In the interim, the local groups have no independent structure for coordinating amongst themselves. One of the immediate effects of not having better inclusion for local groups is that partnerships between international and local actors are rare. The capacity-building and organizational development that partnerships can offer is absent. Some INGOs in northeast Syria are making a conscious effort to work with local NGOs, but they are not the norm. There are simply not many formalized ways for the different types of NGOs to find each other. They of course run into each other in the field of operations, but this is not the same as being able to sit down and analyze what groups might do effectively as partners. In the coordination of the cross-border aid into Syria from Turkey, for example, local Syrian NGOs are well-represented in the meetings of humanitarian groups working in a particular sector. The local groups also have their own coordination mechanisms that in turn work with the international mechanisms. This system has allowed the Syrian groups to speak with a more unified voice to INGOs, to the UN, and to the public. This has created greater visibility for their work. Indeed, a number of donors for the cross-border assistance from Turkey now require partnership with a local organization or deliberate capacity-building for the local groups as part of their grants. In northeast Syria, local NGOs would also benefit from a coordination platform of their own. While too much coordination can drain resources, a basic information-sharing meeting on a regular basis would be a helpful start. If NGOs do not wish to take this on themselves, the Humanitarian Affairs Office of the Self-Administration could spearhead such an initiative, as could the INGO forum that is doing much of the other coordination. The main goal should be to make sure that the work and needs of local groups are easily understood and smoothly integrated into the larger coordination structure. The United States is the largest international donor to the recovery of northeast Syria and should take deliberate steps to build a coordination mechanism for local groups. As was done with humanitarian funding for the rest of Syria, donors should steadily adjust their funding practices and proposal guidelines to encourage more inclusion of northeast Syria’s local aid groups in the work they fund and implement. In addition to enhanced coordination, local NGOs need support to build their internal capacity. All of the local groups with which RI spoke in northeast Syria welcomed the idea of capacity-building. Some groups need training in international humanitarian law and principles. Others want to learn how to work toward eligibility for U.S. government funding. Still others want to improve their ability to be partners with international organizations. Even the most experienced groups expressed an interest in learning to do more. Several years ago, the United States created an Annual Program Statement (APS) that was specifically intended to build the capacity of local Syrian humanitarian groups that were able to implement inside Syria. (4) The funds were designed to help develop local Syrian groups’ ability to respond to disasters and conflict-affected people. Though the total amount of money was small, much of it was disbursed as small grants to local groups to help them gain experience in responding to humanitarian needs. A similar U.S. fund should be established for northeast Syria. Other donors should require local capacity-building as an element of their grant agreements and contracts. These capacity-building programs must be planned in close consultation with the local groups to better reflect their needs. Too often in the initial years of the war in Syria, local groups told RI that capacity-building was more of a box-checking exercise than a good faith effort. For example, they described being trained in the humanitarian principles several times over, but not adequately learning how to document delivery or carry out monitoring and evaluation. In northeast Syria, donors and implementers can avoid that mistake by working closely with local groups right from the beginning to design support programs that respond to the latter’s needs. Local authorities in northeast Syria are struggling to meet the humanitarian needs of their communities without adequate resources. INGOs have a limited presence in the region due to access issues and security concerns, and with their required Damascus registrations, the United Nations agencies are generally not able to work in the region. All of these factors come together to limit the humanitarian response in the country’s critical northeast region. Bringing communities back together will be a fundamental element of recovery and forward progress in Syria’s northeast. The humanitarian response in the rest of Syria, over more than seven years, has offered many lessons learned and good practices for how the international community can work with local aid providers to broaden and deepen the reach and quality of humanitarian interventions. With a growing civil society movement and an interest in self-sufficiency, northeast Syria is well-positioned to be a responsible investment by the United States and other donors in the stabilization of an important part of the country and the Middle East more broadly. 2) There is some cross-border humanitarian programming from Iraq into northeast Syria, but it is subject to the status of border crossings and an additional set of approvals from authorities in Iraq. 4) United States Agency for International Development, APS-OFDA-15-00000 1: Support to Local Capacity-Building and Emergency Response Efforts in Syria, March 2016. No longer available online.